Often when I’m working, an idea will come to me. What can I do with it, so it won’t disturb the “flow” of the project I’m working on? One possibility is to store it in GyroQ, a desktop applet from Gyronix that makes it easy to capture ideas, fleeting thoughts and “to do” items quickly and easily, without having to open MindManager. GyroQ sits in your Windows system tray until it’s invoked with the Ctrl-Q command. A small horizontal window pops up containing an “action item” form field, plus 3 buttons. Simply type in your thought and click the Enter key or the “add” button on the GyroQ workspace. Your idea gets added to the program’s queue, and GyroQ returns to the system tray, awaiting your next idea. When you’re ready to deal with your accumulated ideas, you simply click the “send” button in GyroQ, and the program dumps everything into the MindManager map that you have designated in its preferences for further processing and refinement. Very cool! theRealizer is an add-in from Swedish developer Realize AB that transforms MindManager (and VisualMind) into a powerful brainstorming and problem-solving tool. theRealizer installs a side panel into MindManager, which walks you through a step-by-step process for defining your challenge, generating ideas and prioritizing them. During the challenge definition stage, theRealizer creates a new visual map with three subtopics: challenge, idea and prioritize. You can then select from a list of existing challenges, or create one of your own. During the brainstorming step, the side panel not only displays a dialog box for adding ideas to your map, but you can also click on an icon to display "idea impulse" cards that contain statements or questions that will get your mind thinking in fresh, new directions. During the "prioritize" stage, theRealizer creates a pop-up window that enables you to plot your ideas on a four-quadrant grid, with the X-axis representing realism (how practical is this idea?) and the Y-axis representing the degree of the idea's creativity. You can also automatically add branches to your map to help you sort your ideas. If you need a little help generating fresh ideas, you’ll find theRealizer to be a great catalyst! 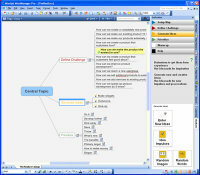 This free application enables you to use Word 2007 to open and edit information captured in MindManager maps. You can then send the edited Word document back to MindManager users, who will see these changes reflected in the original map. How does it do this? Utilizing the powerful XML capabilities of both programs. Essentially, a Word document containing a MindManager map also contains XML code that tells Word 2007 how to manage the embedded object. If you’re working for an organization that only has a handful of copies of MindManager and want to share your maps with a non-user, then the Word 2007 Map Editor is a great, free solution! German developer Ontaris offers a MindManager Pro add-in called OutlookLinker that replaces the mind mapping program’s built-in Outlook linking capabilities with its own high-powered set of tools. When you install OutlookLinker, it places a new tab in MindManager 7’s ribbon toolbar, which enables you to access all of your e-mail messages, contacts, tasks, notes and appointments - without leaving MindManager. It displays data from Outlook in a vertical pane on the right side of the workspace. This window contains a series of tabs across the top, corresponding to each area of Outlook. The panel itself is divided into two sections; the upper pane displays a summary view while the lower pane displays the detail. You can easily drag an item from the OutlookLinker panel into your map; a checkbox at the bottom of the panel lets you decide if you want the link to be a live one or not. If you utilize both Outlook and MindManager, I think you owe it to yourself to see what this powerful applet has to offer. It's like taking MindManager's built-in Outlook linking capabilities and putting them on steroids! ResultsManager from Gyronix transforms MindManager into an awesome tool for visually planning and managing your projects and tracking next actions. MindManager has always been a great tool project management. But it was almost impossible to extract the action items from a complex project map and manage them in a meaningful way. ResultsManager scans your mind maps, looking for incomplete action items, and automatically creates dynamic "dashboards" to help you stay organized. ResultsManager also supports David Allen's "Getting Things Done" (GTD) methodology. When you tell ResultManager 2.0 to create a dashboard, it searches all mind maps connected to your “map central" map (a mind map that contains links to all of your other maps), looking for action items for which you're responsible. It then summarizes these action items in a separate dashboard map. ResultsManager offers two different dashboard modes to users of the program: An express mode, which offers only two simple dashboards that are used for GTD-based planning, and a power user mode, which gives you expanded access to many additional types of dashboards, plus the freedom to customize the existing dashboards or create your own from scratch. There are many more add-ins that enhance and extend MindManager’s functionality. To learn more about these applications, visit the Mindjet Partner Solutions web site. It looks like I'm missing out here because I moved to a MAC!! Do you know who supports addons with MM for Mac?